What a great month May was – A nice number of QSOs, the most DXCCs I’ve worked in a single month ever and a decent amount of new entities including Yemen, The Philippines, Mauritania, Jamaica and Bhutan. I also worked South Shetland Islands for my first QSO into Antarctica. I’m pleased to note that my DXCC count has now reached 200 entities worked and I need to send off another few batches of direct QSL cards to get some more confirmations in. I’ve completed my DXCC on 15m solely using QSOs confirmed in LoTW and am concentrating on 20m now. I’ve worked over 100 entities on 20m so it’s just a case of getting them all confirmed. Even though it’s only five months through the year, I’ve already worked more countries this year than I did throughout the whole of 2011 and the QSO365 project and it’s interesting to look at the statistics on ClubLog. 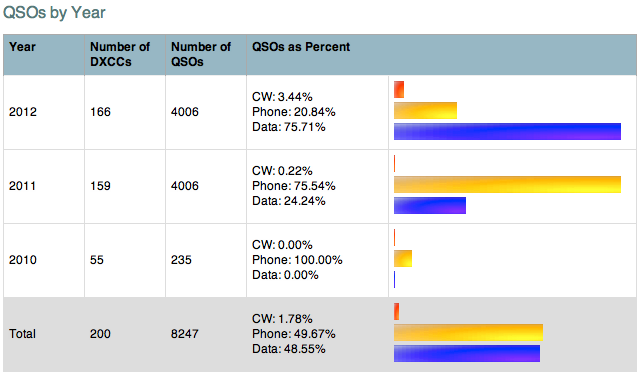 The ratio of Data to Phone QSOs is pretty much exactly reversed from last year but of course this year there’s a growing percentage of CW QSOs as well. It’s a nice coincidence to see that I’ve had exactly the same number of HF contacts already this year as I did during 2011 and we’re not even half way through the year yet. I made 4,138 QSOs in total in 2011 but I’m not including VHF/UHF contacts above, I only upload HF to ClubLog.